In an interview with Al-Monitor, Pastor Ihsan Ozbek of the Association of Protestant Churches named two major obstacles to his community’s quest for true religious freedom: the Turkish judiciary’s failure to respond to their members’ security concerns, and the government’s exclusion of Protestants from the state’s protocol dialogue with other religious minorities. Rev. Ozbek’s remarks came shortly after the Protestant association’s 2015 Human Rights Violations Report was released on 30 Jan. Even though freedom of religion and belief is “secured under national and international laws and the constitutional authority in Turkey”, the report noted, serious obstacles still violate the basic rights of the nation’s 6,000 to 7,000 Protestants, some 80 per cent of whom are citizens of Muslim background. Of particular concern are the report’s details of recurring hate crimes, physical attacks and “serious and widespread threats” against Turkey’s Protestant Christians during the past year. The negative incidents ranged from graffiti scrawled on a church in Balikesir to an assailant insulting and striking the leader of the Batikent Bereket Church in Ankara. Another attacker shot at the Torbali Baptist Church pastor in Izmir with a hunting rifle, as he worked in the fields at his family farm. Two weeks earlier, the Friday sermon from the nearby village mosque had broadcast hate speech from its loudspeakers, well within the pastor’s hearing. Although complaints about these and other reported incidents were lodged with the police, the report noted, no action was taken. But equally worrying, during August a campaign of vicious threats targeted some 20 church leaders from 15 Protestant congregations, who received a barrage of text messages, Facebook postings and emails. Although these death threats were phrased in strident Islamic State (IS) terminology and reported to the police, none of the pastors were given protection. Soon afterwards, two would-be IS suicide bombers were arrested in Ankara, caught on security-camera footage, as they conducted surveillance of churches in the capital. Specific requests to open Protestant places of worship in Ankara and Kayseri were denied during 2015. One Protestant foundation had managed to establish itself in 2000, before the laws on minority religious groups were restricted. But now, the report noted, the 35 other small Protestant congregations are only allowed to organise themselves as associations, rather than official churches. Ozbek’s own church, the Ankara Kurtulus Church, which he has pastored for the past 20 years, remains embroiled in years of legal efforts to obtain an official place of worship in the capital city. Although Ankara’s Cankaya Municipality had approved a suggested site, the location was vetoed last year by the National Real Estate General Directorate and the Religious Affairs Directorate, which decided a mosque should be built there instead. The Kurtulus Church now has a pending case before the European Court of Human Rights to obtain a church property in the capital. The legal right to propagate religion is “still perceived to be a threat”, the report noted; school textbooks continue to describe missionary activities as “a national threat”. The spread of common fallacies about the Protestant faith and campaigns targeting their adherents continue to be manipulated by the media, the report said, as well as nationalist and Islamist circles. Turkey has continued to put on trial individuals accused of “insulting religious feelings” for allegedly slandering Islam, but no judicial action is being taken against acts of open incitement or hate speech targeting Christians. Although the right to conduct evangelistic activities is protected by law, some permissions were denied by local authorities. 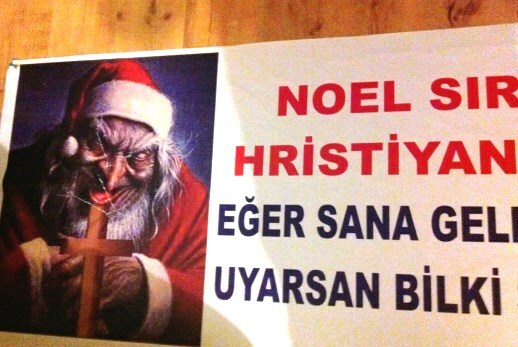 Just as 2015 came to a close, the report confirmed that again billboards and banners carrying hate-filled content against Christmas and New Year’s observances appeared, displayed prominently along the streets of some municipalities in Istanbul and various other cities. One particularly ugly banner pictured a grimacing Santa Claus holding a cross, warning against participating in Christian worship in the guise of Christmas festivities. Since the ruling Justice and Development Party came to power 13 years ago, it has isolated the Protestant community by refusing to grant it even informal state recognition. By contrast, leaders of the Orthodox and Jewish communities continue to have an open dialogue, established through a recognised protocol from the Lausanne Treaty signed in 1923 during the founding of modern Turkey, and the Catholics through formal diplomatic relations led from the Vatican.